Ideal Lending Solutions is here to help you finance your home-ownership dreams. Buying a home is a very exciting milestone in your life. While it is a big investment, it also has many rewards. Finding the right mortgage loan, securing a down-payment, pulling financial documents together, even finding the right house can cause some anxiety. At Ideal Lending Solutions you will work with a dedicated mortgage professional who can explain loan programs and offer great rates to meet your financial goals. 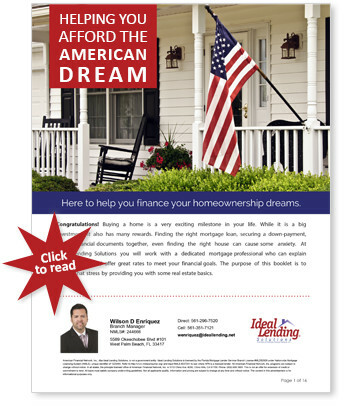 The purpose of this booklet is to relieve that stress by providing you with some real estate basics. There’s a big difference between being Pre-Approved and Pre-Qualified. Home buyers who get pre-approved have submitted documentation and their application has been put through a rigorous process. Pre-qualification is only a preliminary assessment of a borrower’s ability to qualify and requires more time, documentation and examination to confirm eligibility. Home buyers who choose pre-approval and pre-qualification will have different experiences in the shopping process. With the huge number of choices available in equities and mutual funds, it’s almost impossible to for us to securely and profitably manage our own investments. Choosing the right financial advisor isn’t easy either. Here are three questions to help you make the right choice.